Will Our Democracy Still Be Bright? “Tonight I want to speak for two Americans who are too young to vote in this election. My daughter is 8 years old and my son has just passed his first birthday. But though they cannot vote, they are very much concerned with how we vote this year. My husband and I can give them a house and an education, our care and our love. We can try to bring them up to be honest and capable good citizens of this Republic. But there are some things we cannot be sure of providing for them. We cannot be sure when they grow up that our Democracy will still be bright and untarnished as it is today. We cannot be sure – any of us – that our sons and daughters will not grow up into another war. A war this time that no nation could possibly survive. We cannot be sure unless our thinking and our action in the present, particularly our voting action, is clearly on the side of Liberalism. What will it be like in 1960? Will my son be in uniform? Will my daughter be living under the constant threat of robot bombings from a point 5000 miles away? Your sons? Your daughters? I can’t answer that all by myself, but I can answer it along with 30 million other women who will go to the polls on Election Day. Yes, this time, because unhappily but gloriously, so many of our men are overseas, we, the women of America, must have something to say about the kind of country we’re going to have – the kind of world we’re going to have. Our children can’t vote – we must cast our votes IN THEIR INTEREST. A few days ago, a cold, miserable, rain day, I went to see President Roosevelt ride through the streets of New York. With him was his wife. Here were the father and mother of four sons who have been in uniform and under fire since the beginning of war. I saw more than a magnificent display of courage that day. I saw two good people – warm, human people – smiling as they listened to the cheers of 3 million other good people who had braved the rain to wish them well. They were happy – the President and his wife – in spite of the rain and the cold. They were among the people they love – the ordinary good men and women of America who make up the real strength of our Democracy. That night, I listened over the radio to the President’s speech before the Foreign Policy Association; the 3 million people who had stood in the rain – and millions of others – listened, too. For what he had to say vitally affected them and their children. He said it boldly without evasion or – double talk. He said that this must be the last was and he gave us clear directions to the path we must follow to avoid another. He proved that he is continuing to give us leadership. It was a great evening for the millions of ordinary people in this country. It was a great evening for decent thinking people all over the world. It was a great evening for my children – too – though they are much too young to understand it. It was a bad evening for a few others. I’ve heard them, too. It’s hard to avoid it. They seem to be always on the air. I have heard them – trying to win by trickery what they could never win by honesty. I have heard them coming out for an International Organization – the kind of international organization that would make Col. McCormack and Capt. Patterson happy. I have heard them coming out for civil liberties – the kind that would make Gerald L. K. Smith very comfortable. I have heard them coming out for labor rights, too! But aren’t they just a little bit late? And whom do they mean to satisfy? Not labor I think! Yes, some people had a very bad evening when the President spoke. They knew what would happen. They knew that now many intelligent Republicans could no longer follow their candidate. Already some had come over. 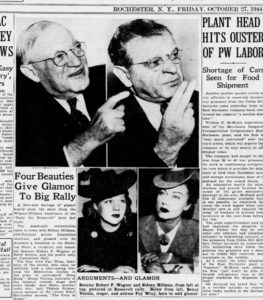 Russell Davenport, Walter Lippmann and now – Senator Ball. He will not be the last – for Republicans have children, too. And in spite of the constant flood of propaganda, they are beginning to think. I am sure that many of them – very many of them – will be voting with us on Election Day. Thanks Victoria for sharing your dear mom’s thoughts of Reason and Hope! I remember well her kind, inspiring and supportive presence. 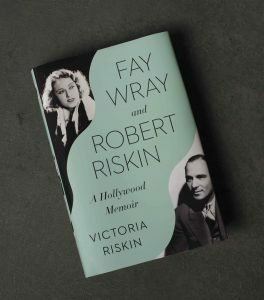 A Hollywood love story, Hollywood memoir, and (dual) Hollywood biography about the woman who stole the heart of King Kong and the man, Robert Riskin, one of the greatest screenwriters of all time, by their daughter, an acclaimed writer and producer.